26.2.33 - 3.4.19 Passed away after a long illness at Wattle Hill Bunbury aged 86. Devoted Wife of Eric (dec). Loving Mum and Grandmother. Reunited with Eric. The tears in our eyes we can wipe away, but the ache in our hearts will always stay. 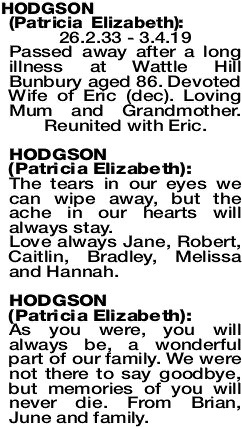 Love always Jane, Robert, Caitlin, Bradley, Melissa and Hannah. As you were, you will always be, a wonderful part of our family. We were not there to say goodbye, but memories of you will never die. From Brian, June and family.